Givenchy Interdit Mascara (for link click here $29) 90 degree applicator brush was inspired by a trick that professional makeup artists use , they bend disposable mascara brushes to grab and cover every eyelash with paint, hence creating a defined lash that looks like real eyelash extensions. I don’t love false lashes, and furthermore, I can’t sit still for three hours to get eyelash extensions, therefore, mascara is an extremely important part of my makeup routine. I am always looking for a good mascara to create false eyelash drama and long eyelashes. 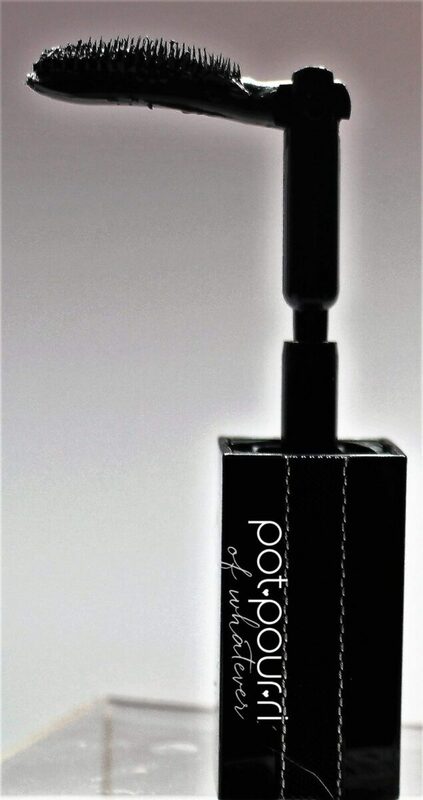 The Noir Interdit mascara packaging is beautiful. If you are a Givenchy fashion fan, you will notice the texture of a black ribbon with silver-beaded edges that is reminiscent of an elegant Givenchy Haute Couture suit jacket. Just like Givenchy’s high end, luxurious fashions, their ribbon-textured mascara tube packaging is well-built, sturdy and has the Givenchy Haute Couture design, depicting a product that is pure luxury at its best. The Givenchy Interdit Noir Mascara is made of a unique stretching formula to give the eyelashes their extension effect. It is not too dry a formula, nor is it too wet. It is a goldilocks formula, because it is just right! The formula is buildable. You are able to create a soft everyday looking eyelash, and with a few more layers, you can achieve a more dramatic night look. Approximately two coats will give you a voluminous look, as opposed to one coat. You will not have any smudging or flaking all day. The color is a deep, dark black. Also, it has a scent that smells like roses. Usually, my mascaras smell like wet chemical-paint. If mascara has to have a scent, I’d rather it smell like roses than yucky paint. What makes this mascara different from all other mascaras is the applicator brush. It starts out straight, at 0 degrees, geometrically speaking. However, it bends to 90 degrees. The bristles remind me of a comb. The comb-like bristles grab every lash from all angles consequently painting every lash. You can not miss a single lash because the 90 degree brush lifts your eyelashes from the root and stretches them out for length. The bristles appear on only one side, instead of all the way around resulting in a comb-like precision application. There is no sloppy mascara mess on your eyelids due to the 90 degree angled brush. Use a zigzag motion going from your roots to the tips of your eyelashes to get the length and definition. Then, unbend the brush to the straight position to create volume. It is easy to place the brush from the straight position to the bent position. Place the wand in the tube and press the brush against the top of the container. The wand will bend. This is how to reach your lashes from the root upwards. Next, brush them in a zigzag motion from the root to the tips to get the length and definition to your lashes. Unbend the brush to create buildable volume. For the best results, apply an eyelash primer. I find this mascara is amazing for length and dimension. It did not give my lashes the amount of volume I can achieve using other brands of mascara. If you want long lashes that look false, this is a great way to go if you don’t want falsies or extensions. What is your secret to create long, defined eyelashes? What brand of mascara is your go to favorite ? Let us all in on your eyelash lengthening secrets in the comment section below.